A warm summer's evening so you can stand on deck with a drink in hand and watch London go by! We are comparing River Thames Sunset Sightseeing Cruise Prices from leading ticket suppliers and Try to find you Cheap tickets prices on the market. A spectacular river Thames sightseeing cruise that takes you down the river at Sunset so you can admire the very best views. The large river boat takes you past Big Ben and the Houses of Parliament, The Shard, The Globe Theatre, St Paul's Cathedral, Tower Bridge, and more. There's a bar onboard and with live entertainment you'll be able to enjoy a wonderful evening of top views, tasty nibbles, and toe-tapping music. Perfect for younger couples and groups of friends looking to spend a fun evening on the river amid a party atmosphere. Great for travellers but also a fun way for locals to spend an evening as they get a different view of London from the water. Great if you know London a little, and know the sights you'll be passing as there is no onboard commentary. Not suitable for families with kids under the age of 13 due to an age restriction. Your Experience With River Thames Sunset Sightseeing Cruise? Cruise down the River Thames as another day comes to an end with the sun slowly setting in the sky. You'll be welcomed onboard with a glass of sparkling wine. Either sit back, relax, and and watch London's most iconic monuments pass by as the sunsets behind them creating some stunning photo opportunities, or stand on the open deck and feel the breeze in your hair as you glide under Tower Bridge and past many other London monuments including Big Ben, The Shard, The Globe Theatre, Tower of London and more. Throughout the 2 hour cruise you can enjoy a range of canapés and there's an onboard bar so you'll be able to top up your drink once you've finished your complimentary glass of sparkling wine. 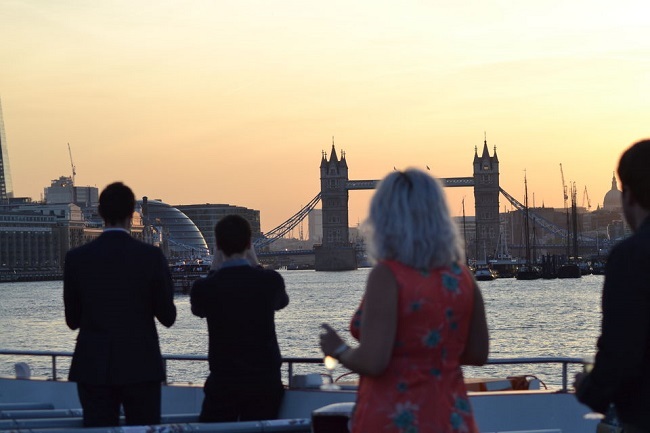 There's a real party atmosphere aboard and you can enjoy the live music performances with an array of jazz and pop songs that are sure to get your feet tapping to the beat as the sun goes down over London. What River Thames Sunset Sightseeing Cruise Includes? 2 hour river Thames cruise. Glass of sparkling wine and canapés. Live entertainment with pop and jazz performances. Some of the best sunset views! To make the most of your experience and the views, stand on deck rather than sitting downstairs. Travelers Reviews about River Thames Sunset Sightseeing Cruise? Travellers and locals talking about this cruise on Get Your Guide, Viator, and Trip Advisor give it really good reviews for the most part. Everyone agrees that seeing London at sunset is fabulous though some people had hoped for some commentary on what they were seeing. Comments such as "We both enjoyed every minute of it." "The singer was great; she created a wonderful atmosphere" and "Stunningly beautiful scenery , good entertainment too" show that this tour comes recommended from others who've already done it. Everyone agrees that the staff are friendly yet professional. Boarding commences 15 minutes before departure.